A few years after Guided Study Hour came to Newfound Regional High School, students and staff are starting to wonder what school was even like without it. 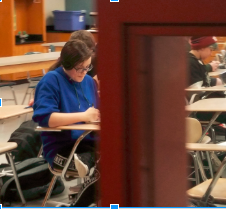 The original proposal for Guided Study (GS) argued that this time would improve grades, social wellness, and mental health of students at NRHS, and some of these effects are now becoming prevalent. Still, some critics think GS is taken advantage of. Even students agree that some of their peers don’t utilize study hour appropriately. Mr. Lellos, Social Studies Department chair, thinks GS needs more structure to ensure its actually working. Giving students free time to work always has its risks, but most students at NRHS agree that GS brings more benefits than detractions to the academic climate for students. While there are students who don’t need GS, those who do rely on it to stay on track to graduate. Although some NRHS staff, like Mr. Lellos, see problems and kinks with Guided Study at NRHS, the benefits that it provides makes most NRHS students happy they have it offered to them.